Queen of the Night tulips, otherwise known as black tulips. In this, the second part of her series about black flowers in your garden, Cathy Isom lets you know about some flowers that will add a little mystery to your garden. That’s coming up on This Land of Ours. Black Star Calla Lillies – Deep, purple-black, mysterious blooms that grace any wall and add a little drama or a gothic flare to the master bath with these flowing, goblet-style flowers. Calla lilies grow up to two feet tall and bloom at midsummer for a spectacular contrast to the season of sunlight and short nights. 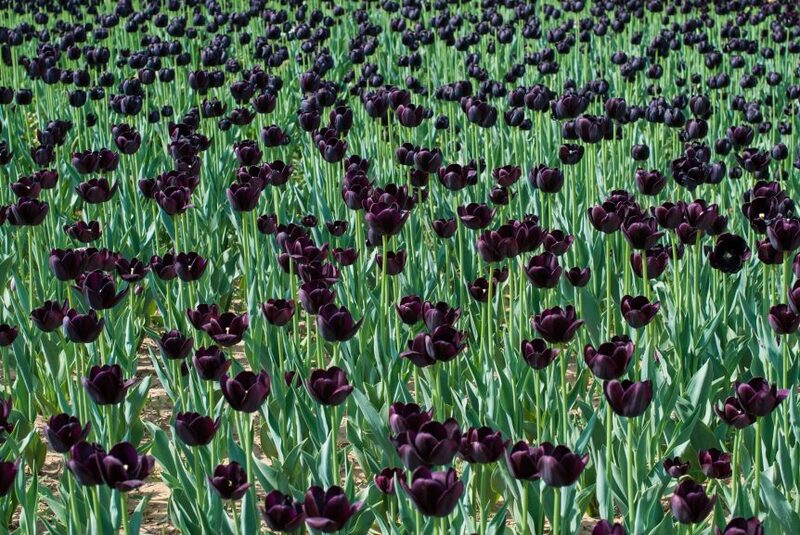 Queen of the Night Tulips — Soft, maroon-black traditional tulips with velvety dark petals and a tall, graceful stem. They are tulips, so they’re easy to grow! Black Wizard Asiatic Lily — An absolute stunner! The Black Wizard is graceful, simple, haunting perfection in a spooky summertime garden. Plant this lovely flower between irises or as a point of contrast with bright red poppies. Black Magic Sunflower — With a perfect sunflower shape and the darkest of dark petals, this darkest of sunflowers swallows up the light. Any flower bed will flourish with this beautiful flower. Black Magic towers above the rest of the garden at a height of up to six feet!